I have a problem with defining fasteners idealization in Simulate (Creo 2.0 M110). the question is, can I define in some way an idealized bolt for this case without having to add material (otherwise it would be convenient to directly add the bolt itself)? Try adding a surface region or volume region where the fastener bounderies are. 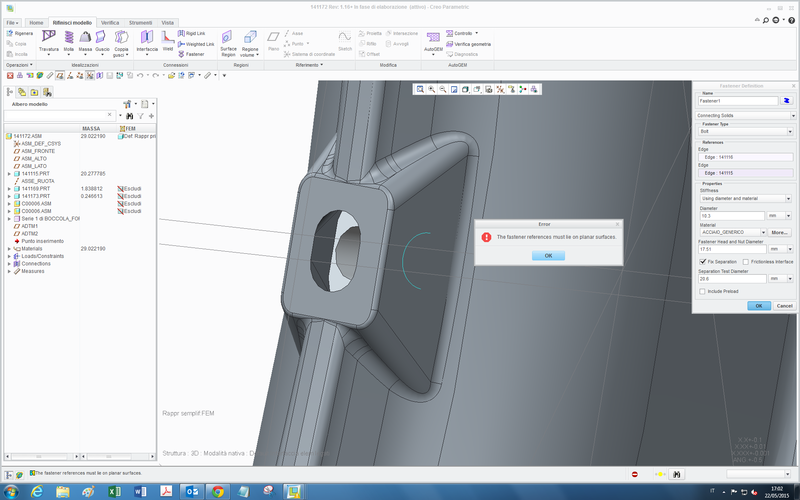 This will give you a valid flat edge / line on the cylinder surface to select. Unfortunately beams can't be used in large deformation analysis, even though the beam itself does not undergo large deformations, other than "rigid" body motion. I tried with a surface region in simulate but it can be created only on already-existing surfaces. In paametric instead, if I create a surface just inside the edge, in simulate it is not recognized and the error message still appears. With a volume region how can I do then to define the bolt? I was incorrect, you can use my approach for the end of the screw but not for the head. You will need to use Mats suggestion or model the fastener as a solid and use the preload feature. thanks for the tips,how you define a beam? with a curve between the two points in parametric and then you define them as beams in simulate? or this can be done directly in simulate selecting the two points? I typically create a point-point beam, from hole center to hole center. 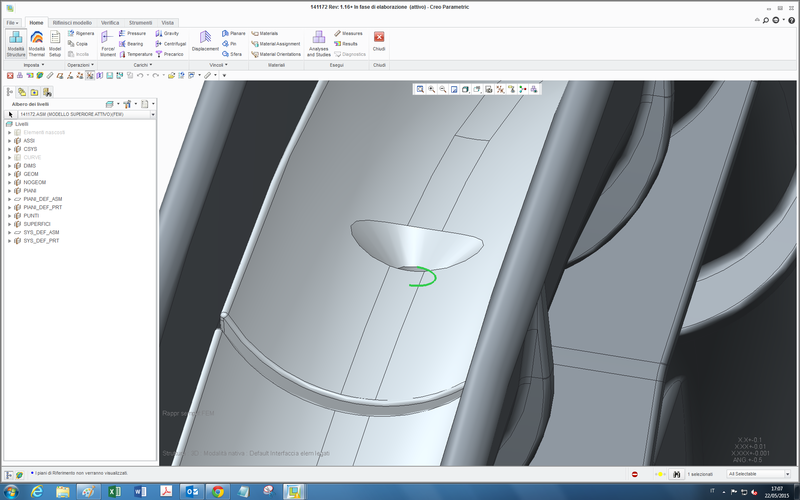 And yes, you can create the datum points in creo simulate, either on the top level, or on part level. If you create datum points on part level, in the creo simulate environment, the points end up as "Simulate features" in the model tree for that part, and are only visible in the simulate environment. This technique is useful when the prerequisites for the "fastener" are not fulfilled, for example non-circular hole, or the surface might not be planar or parallel.